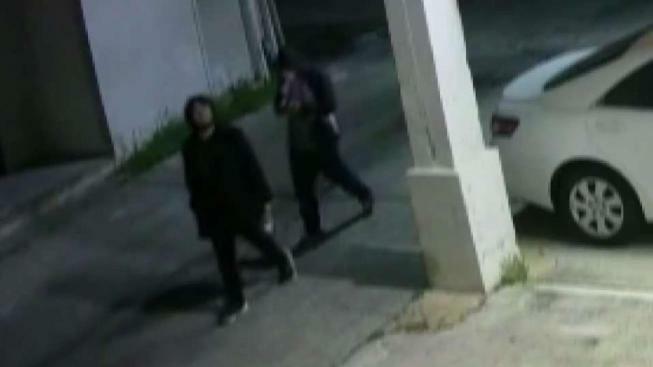 Fire officials are investigating at least three suspicious fires in downtown San Mateo Thursday morning, and they believe they have the suspects on surveillance video. One fire started at a dumpster behind a blood donation center located at 48 Second Ave., according to fire officials. 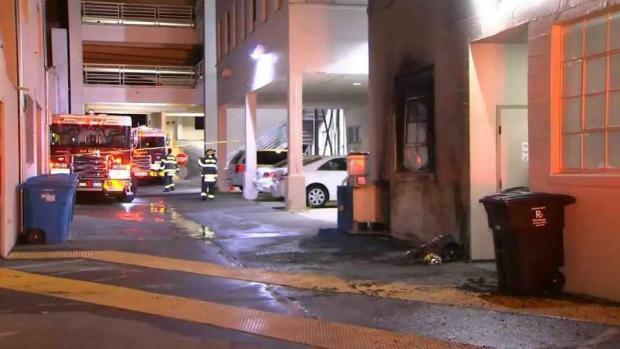 Around the same time, another fire was reported in a neighboring parking garage located at Second and El Camino Real. The third fire ignited at the JoS. A. Bank store at 208 E. Third Ave. Witnesses told fire personnel that they saw people running from the downtown area, but no suspect descriptions have been released at this time. Surveillance footage captured two suspects starting fires in garbage cans. Police released the video of the suspects wandering from trash can to trash can. Investigators say they don't believe they had an intended target. But they set three fires in about 30 minutes. Fire officials are investigating at least three suspicious fires in downtown San Mateo Thursday morning. Kris Sanchez reports. A blood donation center called Vitalant had the most damage on part of its wall and a melted window. The sprinkler system activated because of heat, and the center sustained water damage.